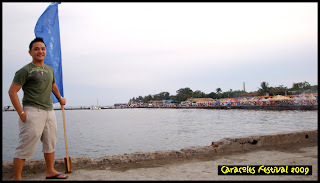 OLANOLOGY: Chronicling Life's Events Travels and Places CARACOLES 2009: Sun Down to Sunrise Party Fiesta! 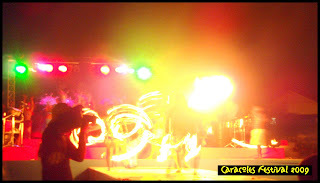 CARACOLES 2009: Sun Down to Sunrise Party Fiesta! 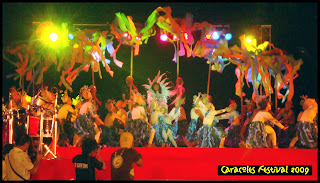 FROM the Island Garden City of Samal, the CARACOLES FESTIVAL came to the City of Davao last April 25-26, 2009. 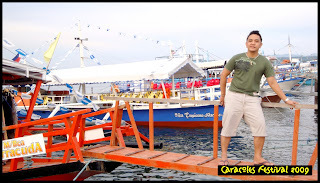 CARACOLES or the Sun Down to Sunrise Festival is an annual spectacular event in the Islands of Samal to celebrate the marine wealth and aquatic riches of the Davao Gulf. 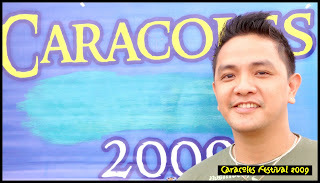 Caracoles which literally mean "shell" has annually become popular event in the Islands of Samal and has attracted tourists and spectators in the Davao Region, thus, gaining its title as the Summer Festival of Shells. 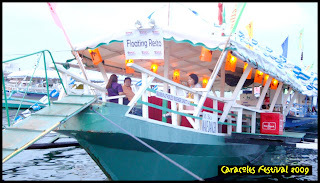 Just recently, the main organizers of Caracoles have decided and designed to make this Festival a mobile event giving neighboring cities and municipalities the opportunity to host the festive occasion, thus, giving more people the chance to learn, appreciate and care for the Davao Gulf. 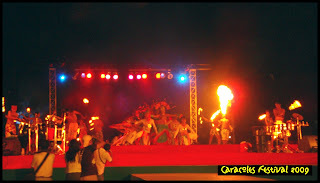 But of course, a great opportunity to attract tourism potentials is also expected. 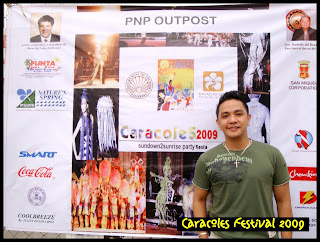 This year, Davao City proudly took part to host Caracoles 2009 signifying that the city is one of the finest places to spend the Sizzling Summer! 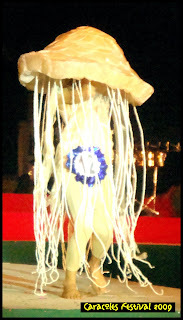 The day-long event was held in Sta. Ana Wharf where the whole place was transformed to a festive and colorful venue. 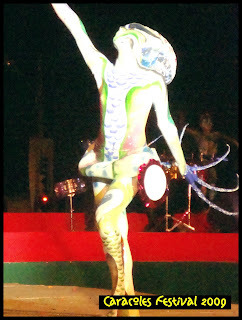 Festival props and decors of vivid hues were all over the place giving visitors the festive spirit and jovial mood. 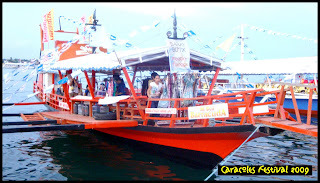 There were floating restaurant were visitors could dine, floating boutiques where guests could shop, and of course, the ever flowing food carts and food stalls lined up to give visitors choices and variety of delicacies to choose from. 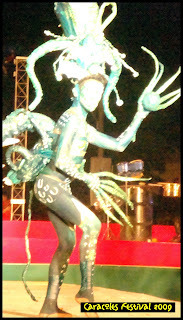 AND AT NIGHT, some the festival's highlights were featured and witnessed amazingly! 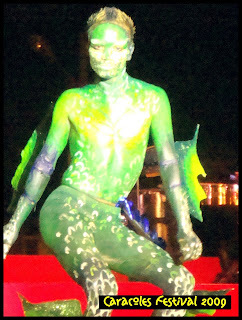 BAILE DEL AÑO - a rhytmic, metrical and theatrical performances done on stage pedicting marine life preservation and environmental awareness. 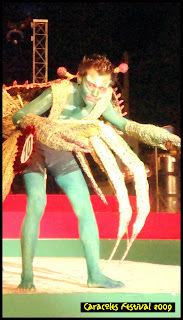 ESTRELLA DEL MAR - a parade of various sea creatures' costumes strictly designed using eco-friendly materials staged through appropriate creature's movement. 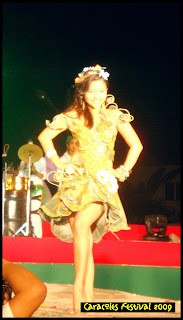 GLORIA MARIS - a parade of innovative apparels made by local artists with imaginary and artistic designs. 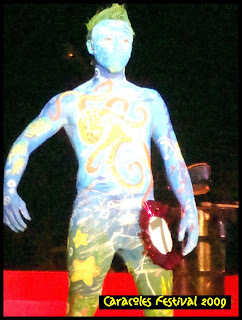 ARTES CUERPOS - a parade of marine-life-themed human body painting artistically created, designed, painted by local artists. 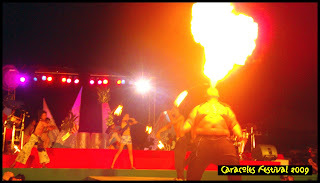 CARACOLES FESTIVAL: Sun Down to Sunrise Party Festival! 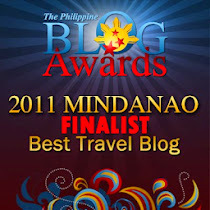 Another great treat for the Sizzling Heat of Summer 2009! ay goodness olan! i was supposed to be here pero tinamaan ako ng lagnat. 'di na naman tayo nagkita dude. hi. what's T2 nga pala? 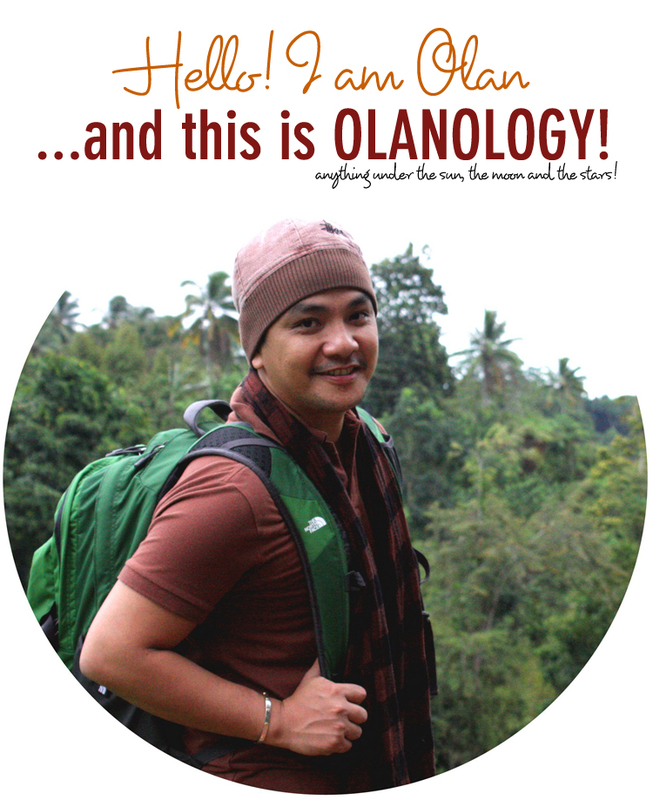 i like your first photo on your "passport" foto-me series on your side bar pala. 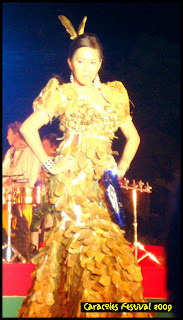 kunwari mahiyain. haha. 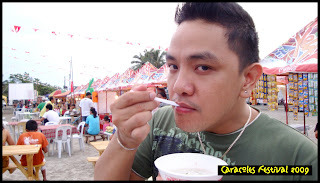 hmmmm..taga davao ako..pero hindi ko ata alam..nice pictures and post as well..
@ REENA - Caracoles makared its 5th year this 2009. 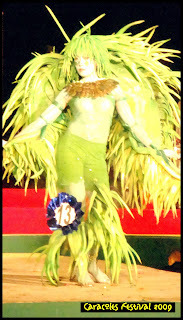 A lot of colorful costumes pa tlga di ko lang maipost lahat. Thanks. 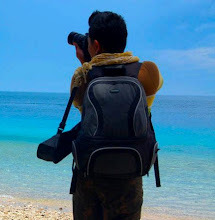 Photo ko yun Facebook Badge. Hehehe. 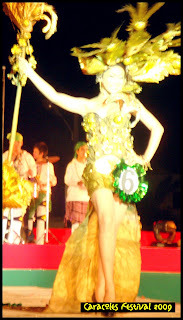 @ EXANDER - last April 25 ito. Wala ata silang gaanong media exposure kaya di gaanong naadvertise sa public. 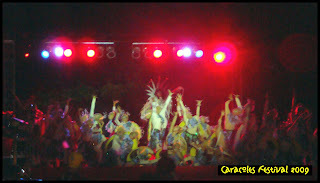 nevertheless, marami rami rin namang tao. 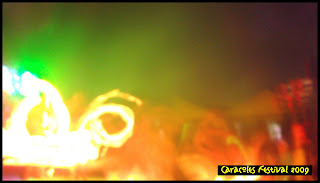 coincidence nga noh taga wellspring ka. hehehe. yan ang magandang puntahan dyan. salamat sa pag feature nito olan. 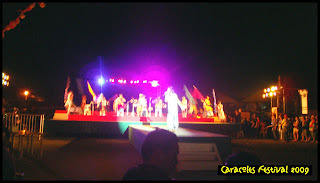 ganda ng festival. 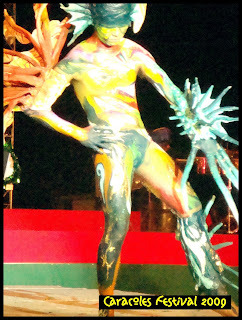 parang gusto ko rin pa body-paint.